The Port of Lisbon (Porto de Lisboa) is the largest port in Portugal. 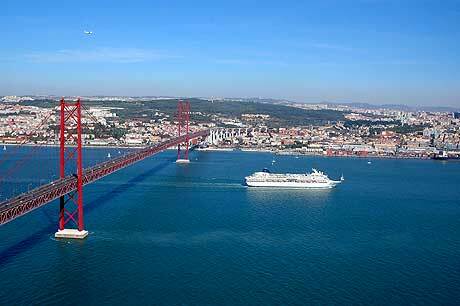 It is located on the Tejo (Tagus) River estuary, and it is both a commercially and a tourist oriented venue. The port activities are carried out on the both banks of the river, but from a tourist point of view, what matters is all the recreational docks and cruise terminals are located on the north bank of the Tejo River. The three cruise terminals are the Alcantra Cruise Terminal, the Santa Apolonia Cruise Terminal and the Jardim do Tobaco Quay, whereas the four recreational docks are the Alcantra Dock, the Belem Dock, the Bom Sucesso Dock and the Santo Amaro Dock. From any of these terminals and docks, tourists can get in virtually no time to the center of the city, either on foot or by bus, by tram, by taxi or even by train, given the port is accessible by road and by railway alike, as far as the land connections are concerned. Plenty of attractions are within reach, such as the Lisbon Oceanarium or the Maritime Museum, but the port in itself features a great leisure infrastructure, consisting of restaurants, bars and cafes, not to mention the fact the port is often home to sundry cultural, artistic and sports events, meaning it is an important part of the life of Lisbon, not only from an infrastructural and commercial point of view.